Did you know there are huge cables going under the sea carrying all your internet and telecommunications across continents. 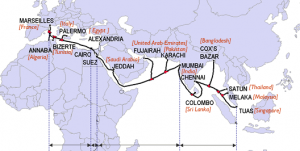 One of these underwater cables had a “shunt fault” crippling the Middle East and subjecting them to limited internet connectivity to the rest of the world. The incident occured this weekend after the main SeaMeWe-4 cable came into contact with sea water somewhere in the Mediterranean causing it to fault. This caused the Middle East communications to fall back on either satellite or to route their internet traffic through the land based networks and also by using older cables such as the SeaMeWe-3 and the FLAG Europe-Asia cables to continue connectivity. The SeaMeWe-4 cable (South East Asia-Middle East-West Europe 4) connects between Europe and Egypt and stretches for about 20,000 km. The cable was a joint initialtive to start to bring all the Eastern front up to speed with the rest of the world and to boost the internet communications. A repair ship is already on-site and should have the cable fixed in a couple of days. Recently Middle East was crippled by a cable cut. Underwater cable problems are not new, about 55 were reported in 2009. Isn’t it amazing to know that the call you just made travelled under the sea to another country. Middle East Internet is a great thing…….